The pressure compensator DWM12130Y is a normally open, direct-acting, spring-loaded flow control valve. 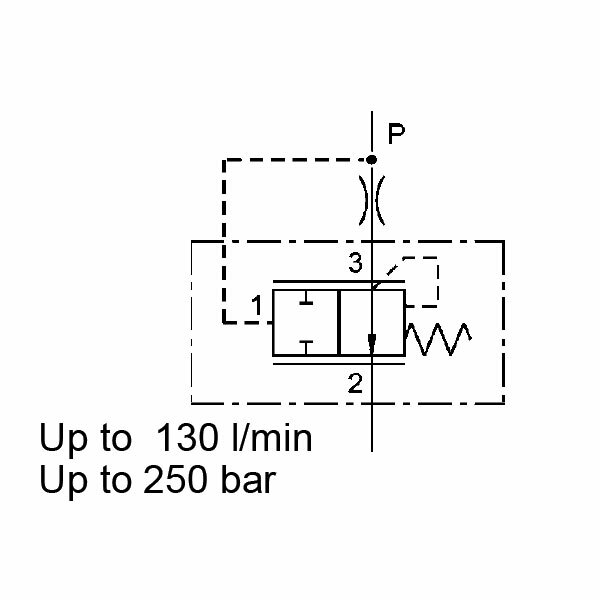 Indeed, by maintaining a constant differential between inlet and outlet pressure of an orifice (ports 1 and 3 of the pressure compensator), there is a maintenance of a constant flow rate (independently of the load pressure). As soon as the pressure differential exceeds the value pre-set by the spring force, the control piston reduces an orifice cross-section. Therefore, the utilisation of the pressure compensator can, for example, be for when lowering variable loads at the same velocity. Also, together with a proportional flow control valve, it can serve as a 2-way proportional flow regulator. Moreover, in a load sensing system in which several consumers are operated, the speed of each individual circuit can be controlled.